As we gear up to celebrate Thanksgiving, Native Americans are fighting for their right to their own land, clean water and now, their lives. 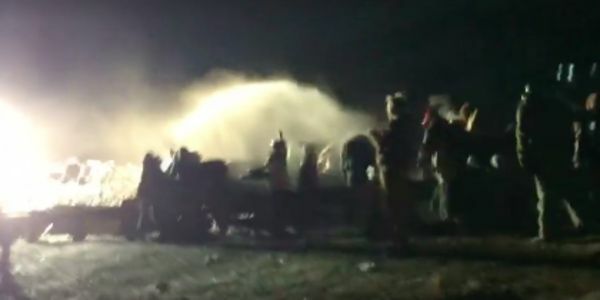 On Sunday night, Dakota Access Pipeline unarmed protesters were blasted with tear gas, mace, rubber bullets and water cannons for hours in 23-degree weather, all while simply trying to clear the road for emergency services. While all of this violence is unacceptable, the freezing cold water cannons are especially cruel given the temperature; protesters could easily get hypothermia and even die! Please join the Standing Rock medics in begging Morton County law enforcement to stop the use of water cannons on peaceful protesters immediately. Protesters were simply trying to clear the road to allow emergency services to get to their camp when the militarized police force assaulted them for hours on end. The medics at the scene said 300 people were injured, 23 of whom ended up in the hospital. The majority of the injured got hypothermia from the freezing water cannons. Frontline journalists were also targeted and shot with rubber bullets, press drones were shot down and some protectors were shot in the head with rubber bullets and fell unconscious. This dangerous, potentially lethal treatment of peaceful protesters cannot stand. These people are using legal and unarmed tactics to simply protect their water supply and Morton County may end up killing them. Add your name to ask them to cut the worst of their tactics out: using a freezing water cannon in sub-freezing temperatures.